Do you do business within a defined geographic area and want to focus your lead generation efforts to visitors from that area? In this case study, you’ll see how Inbound Marketing used OptinMonster to increase local leads by 189%. Inbound Marketing Agency helps businesses in Perth, Australia grow their website traffic, leads, and sales using search engine optimization, pay per click advertising, email marketing, and social media. Adam Rowles from Inbound Marketing talked with us about how they’re using OptinMonster to generate leads for their agency. Before OptinMonster, Adam was using several different WordPress plugins to capture leads. Each had their own features and limitations. With each new plugin they tried, the risks for conflicts between plugins went up. We were using tools ad-hoc. However, this was time-consuming and didn’t achieve the results we wanted. From an agency perspective, we wanted a centralized platform to manage everything. This was the main reason Adam chose OptinMonster: to streamline the process of creating and launching lead generation campaigns. Once he switched to OptinMonster, Adam set his mind to capture more qualified leads using Inbound Marketing’s existing lead magnets. A lead magnet is a valuable piece of content offered in exchange for a visitor’s email address. 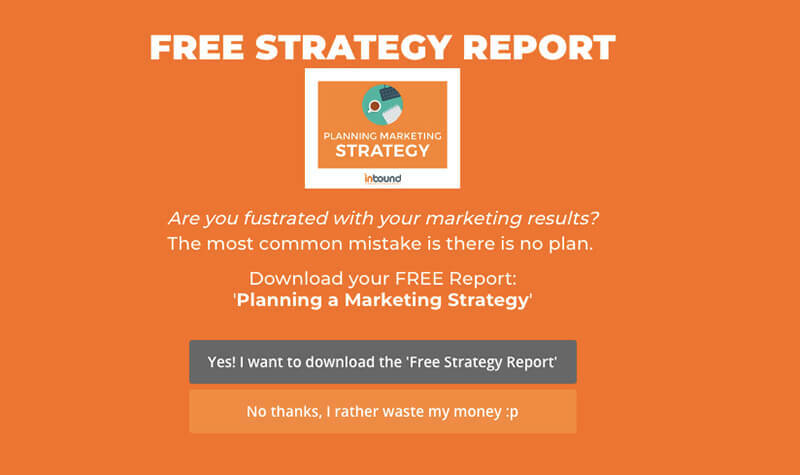 One of Inbound Marketing’s most successful campaigns uses a fullscreen welcome mat to tease visitors with a free strategy report. A fullscreen welcome mat pops up over the entire website, hiding the content behind it from view. Fullscreen campaigns are great for focusing the visitor’s attention on a single call-to-action. This campaign shows up for any visitor who has been on the site for at least 10 seconds. Inbound Marketing converted 5.75% of visitors with this campaign. Inbound Marketing isn’t the only OptinMonster customer who has seen success using lead magnets. RocketBots converted 7.33% of visitors with a lead magnet! Drawing on the success of the first campaign, Adam added another. 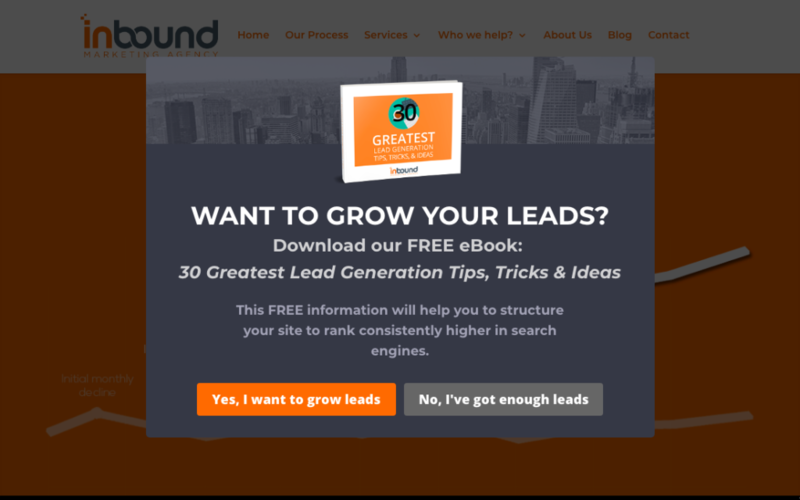 The lightbox campaign below offered Inbound Marketing’s best lead generation tips, tricks, and ideas in exchange for an email address. The campaign appears only when the visitor attempts to leave the site, triggered with our exit-intent technology. Exit-intent campaigns trigger when the visitor’s mouse motions towards the browser bar. That’s a clear sign they’re about to leave the site. Since nearly 70% of visitors to a website will leave without taking any action, you lose nothing by trying to get their attention one more time before they leave. The exit-intent campaign above recovered 3.59% of abandoning visitors. Inbound Marketing also took advantage of OptinMonster’s geolocation feature to ensure anyone who subscribed to their list met one of their key requirements for being a qualified lead: they must be located in Australia. Visitors located outside of Australia won’t see any OptinMonster campaigns. Inbound Marketing converted 5.75% of visitors using a fullscreen welcome mat. Inbound Marketing recovered 3.59% of abandoning visitors using exit intent. Inbound Marketing increased conversions 189% as a result of using OptinMonster. 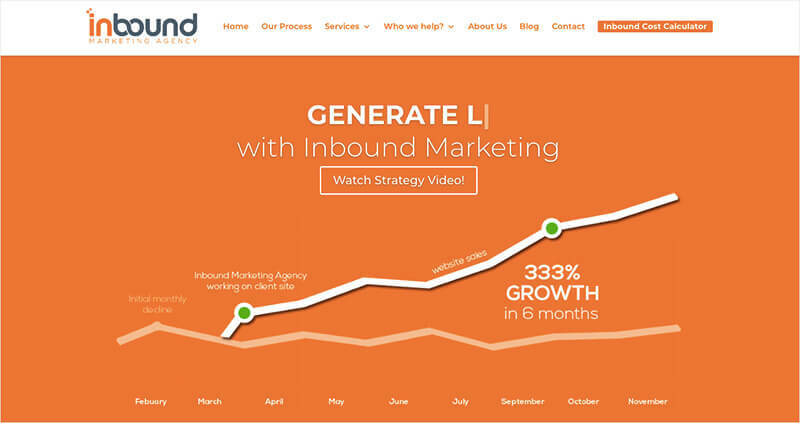 Inbound Marketing had one main goal for using OptinMonster: to streamline their lead generation efforts. OptinMonster’s powerful display rules and easy-to-use drag and drop builder allowed them to do just that! Before using OptinMonster, our website conversion rate was 2-3%, as expected. Since using OptinMonster, we have been able to improve conversion rates to 5.75%, a 189% increase.